Check out our new boat! We were able to pick up this 2001 Mastercraft Maristar for a good price. The body wasn't in too great of shape, so it was a perfect candidate for a wrap. We stripped the graphics off, they were already starting to peel and chip off so this was a pretty simple task. Then the hull was washed with JJV's Best to get rid of the yellowing. We filled in one of the deeper scratches with with bondo, smoothed it out and primed it. The boat was then cleaned and ready to wrap. 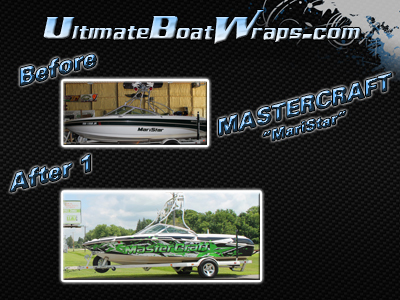 Check out the before and after of the 2001 Maristar.